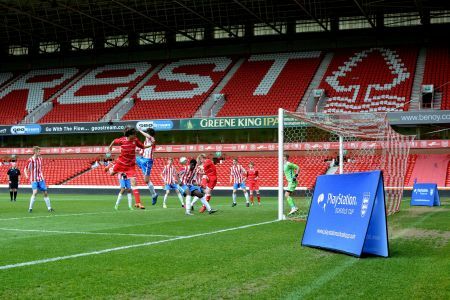 The Final took place on Tuesday 3rd May at The City Ground, home of Nottingham Forest Football Club between Bristol & South Gloucestershire Schools' FA and Liverpool Schools' FA. A great start from Bristol & South Gloucestershire saw a couple of early attacks including a header over the bar from range by Takayo Nembhard. 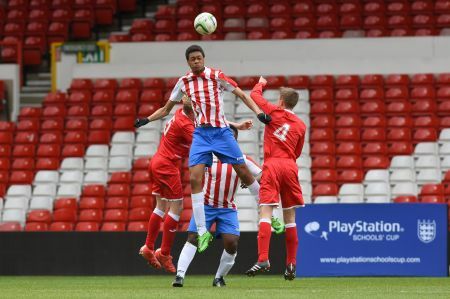 Liverpool looked to attack long through Luca Connell. He flicked on for Sonny Hilton but blazed a half volley over the bar. Liverpool won a free kick close to the halfway line and captain, Dean Taylor, delivered a lovely ball which was met squarely by central defender, Carl Spellman, to open the scoring putting Liverpool 1-0 up. Bristol & South Gloucestershire looked the livelier of the two sides, but Liverpool's defence held strong limiting Dan McBeam and Lucas Tomlinson to long range efforts. 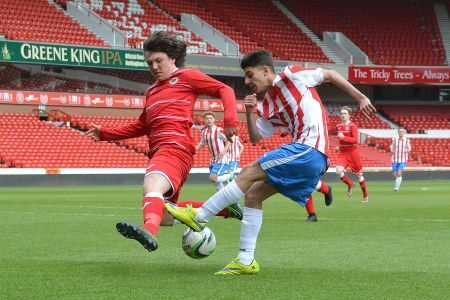 Liverpool could have had a second through Charlie Jolley as he drifted into the area only for a fantastic covering challenge from right back, Josh Bailey. Bristol & South Gloucestershire had the ball in the net, as centre back, Tommy Mahew, tapped it in as the ball dropped down from a free kick. Their celebrations were cut short as the assistant referee had his flag raised for offside. The teams went into the dressing rooms for half time with Liverpool leading 1-0. The first ten minutes of the second half were frantic as Bristol & South Gloucestershire came out fighting and had all the early pressure. Centre back, Tommy Mahew, delivered a great ball into the box only for Ellis Mooney in the Liverpool goal to get his hands on it and scramble it away. A couple of strong tackles saw the temperature raise as both teams came close to boiling over, luckily the referee stepped in to calm down the players. Mooney was once again called into action as Bristol & South Gloucestershire earned a free kick 25 yards from goal. Mahew struck it sweetly enough but couldn't evade the goalkeepers glove as he tipped it over. Bristol & South Gloucestershire kept pressing as Genetius Eziac attempted to hit a half volley toward goal after some excellent running from adventurous full back, Josh Bailey only for the Liverpool players getting their bodies in the way to block the shot. 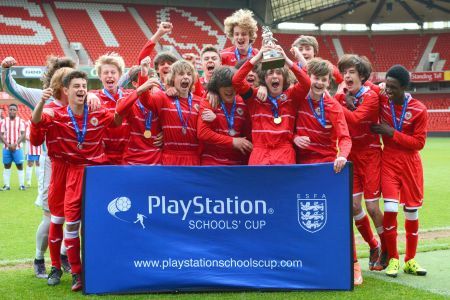 Liverpool were defending resolutely in an attempt to win their 19th U15 Inter Association Trophy. Bristol & South Gloucestershire were not going down Quietly and an attacking corner produced their next chance as the delivery wasn't dealt with and smashed against the Liverpool post. Sonny Hilton broke away at the other end of the pitch and could have doubled the Reds lead except for an excellent recovery challenge from Sam Lacey. A raft of substitutions looked to change the game and Bristol & South Gloucestershire substitute, Owara Edwards, could have levelled the score with his first touch but hit a tame shot straight at the keeper after Nembhard had squared to him inside the box. As the clock ticked into added time, Bristol & South Gloucestershire got the chance they had worked so hard for, as Nembhard dazzled with some great foot work as the whole goal opened up in front of him, he leaned back and powered agonisingly over the bar and into the empty stand behind. The referee put an end to the game which saw Liverpool take home the Trophy for the 19th time in their history. Wilson, Bailey, Ayaabah, Mahew, Lacey, Spark, Eziac, McBeam, Nembhard, Haughton, Tomlinson, Neale, Morgan, Edwards, Scott, Hawkins. Head over to 247.tv to watch the game back, which has full commentary and replays. DVDs are available for £10.00 by clicking the link above. All photos were taken by 353 Photography. To view and purchase some top quality photos please click here.